What do you think about when you hear the word “tired”? Do you think of physical, mental, or moral fatigue? You can use the word “tired” after a busy day at work or while in the audience during a show that is too long. In short, it is a word that has a very broad range of meanings. There are also many figurative expressions that we can use to describe our state of tiredness. 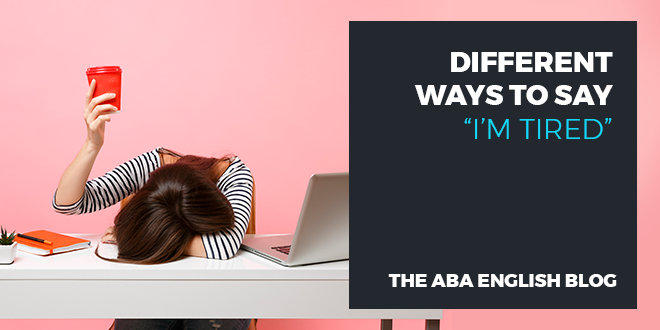 Different ways to say “I am tired” in English presented by @abaenglish. Even in English, there are several words and expressions to describe a state of exhaustion or fatigue. The most common expression is “I am tired”. This phrase sometimes generates some confusion even among native speakers, as it is often associated with sleep and the desire to sleep. But, in reality, from a purely semantic point of view, it simply indicates a general state of tiredness. In English, however, there are many other words and expressions that can be used to describe this condition. Let’s take a look at some of those that are most commonly used. This expression in English indicates a very strong state of exhaustion after intense activity. Literally meaning all of the liquid has been taken out of you, this phrase indicates a state of fatigue in which you have no more energy available, like something that has been left completely dry. This term indicates a state of intense fatigue. This expression is part of British slang and is very informal. The etymology of this term is uncertain but probably derives from knacker, an old word that could indicate a cheater and later on an animal or fur buyer. The phrasal verb wear out means deteriorate or erode. It is generally used in reference to objects or items of clothing that have been made unfit through overuse. It can be used to indicate a condition of severe exhaustion. This figurative expression, which literally means you only have one leg left, can indicate unbearable fatigue or the condition of those who feel as if they are about to die. The adjective weary indicates a state of weakness due to some extended effort or a situation that has lasted a long time and has left you without strength. Washed out is used to indicate the loss of colour in a garment due to constant washing. In a figurative sense, it indicates a state of exhaustion that leaves you without energy. The verb to wipe means to sweep or clean completely. The expression wiped out, therefore, indicates the feeling of not having more energy, as if it had been swept out of your body. This figurative expression is used to indicate that you are very sleepy, to the point in which your eyes are closing themselves. To beat means to punch or to defeat. Therefore, the expression I am beat indicates that we are completely defeated or knocked out by fatigue. The English adjective shattered means destroyed or demolished. In informal English, it can be used to indicate that you feel extremely tired – as if your bones were broken. These are just some of the many expressions to define tiredness in English. They are surely enough to show you how rich the English language is in colloquial expressions, idioms, vocabulary, and phrasal verbs to indicate the different nuances of a concept. If you want to enrich your vocabulary and communicate more expressively, try the online course from ABA English. Our classes and materials have been specially designed to prepare you for daily communication in English, with all of its richness and complexity. OK, I want to try a video class! OK, I’m going to download the application!